Robin Williams' brilliant irreverence and unparalleled talent for improvisation and impersonation shone on NBC over the years — spanning more than a dozen visits to "The Tonight Show" alongside Johnny Carson and Jay Leno, jokes with Jimmy Fallon on "Late Night," hosting duties on "Saturday Night Live" and mornings with the "Today" show family. Williams, then 30, made his first appearance on "The Tonight Show" on Oct. 14, 1981, promoting the fourth season of "Mork & Mindy" and his upcoming film "The World According to Garp." A decade later, hardly anything could keep Williams sitting in his seat, as he preferred to jump up every other minute with one impersonation after another, before discussing his transition into a more serious role for the film "Awakenings," which earned him a Golden Globe nomination for best actor in a drama. A temporarily blonde Williams appeared on Carson's final night hosting "The Tonight Show," on May 21, 1992, talking about the political gaffes of the day and jokingly urging Carson to run for political office. Williams dropped by "Late Night with Jimmy Fallon" on May 25, 2011, and discussed his affinity for video games — especially "Call of Duty." 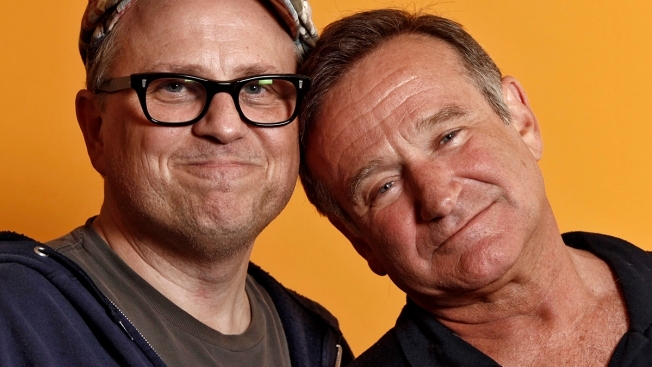 Williams joined Jay Leno on August 8, 2013, to talk about returning to television after 32 years to star in CBS' "The Crazy Ones," reminiscing about the early days of "Mork & Mindy" and trying to make a name for himself in television. Throughout his prolific career in film and television, Williams never left his roots in stand-up comedy. The monologue he gave during his first time hosting "Saturday Night Live" in 1984 showed his proclivity for the art form. On Tuesday, "Today" aired a special collection of clips from Williams' many appearances on "Today," and the kindness he showed every member of the crew and fans outside Rockefeller Center.